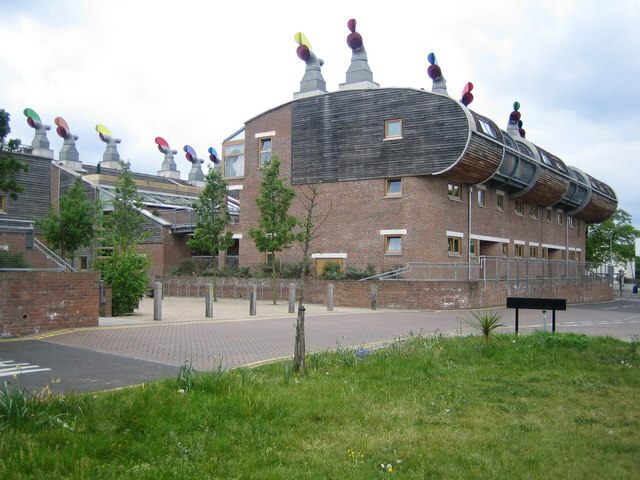 BedZED is multi-unit housing development located in Hackbridge, London, England that was among the first in the UK to set a goal to be zero energy and carbon neutral. Built from 2000-2002, BedZED consists of 82 houses, 17 apartments, and 1,405 m² of workspace. The project was designed by architect Bill Dunster and was completed in partnership with the BioRegional Development Group, the Peabody Trust, Bill Dunster Architects, Arup, and Gardiner and Theobald. BedZED's energy system begins with energy efficient design. The homes have south facing terraces that make use of passive solar principles that benefit from the sun's natural light and heat. Offices face north to reduce the need for air conditioning, a major power user, during warm days. The complex additionally makes use of high efficiency appliances, visible meters to encourage energy awareness, triple glazed windows, and high thermal insulation. 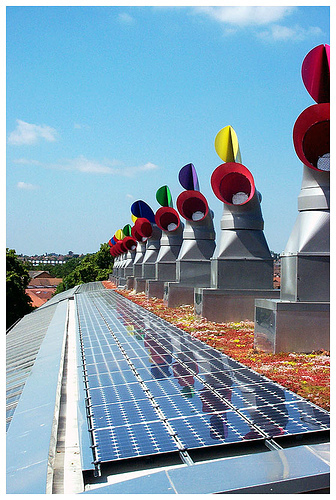 BedZED's original aim was to utilize exclusively on-site sustainable energy sources. 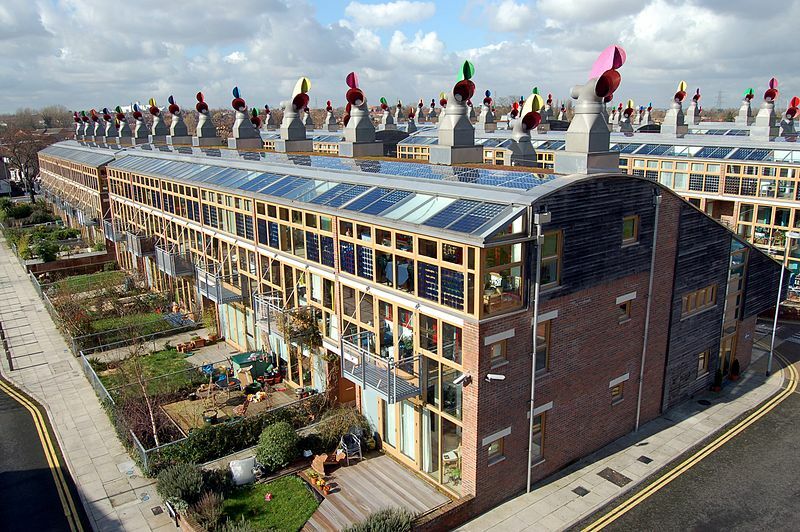 777 square meters (108 kilowatts) of building integrated solar photovoltaics cover close to 20% of BedZED's power needs. For the first few years after construction, the remainder of the power supply came from combined heat and power (CHP) utilizing local tree waste that would otherwise go to landfills. However, while it worked for the first few years, BedZED's particular CHP unit ran into technological problems, and the manufacturer was unable to satisfactorily resolve the issues before closing its doors. 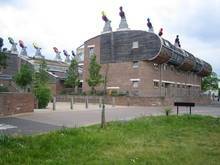 While BedZED has been using gas to make up the difference since 2005, there has been talk of plans to replace the CHP system with a biomass boiler. This type of technology has matured since BedZED was first designed, and in addition to providing electricity, would also heat water and interiors of buildings. Also under consideration is that some of the development's energy needs may need to come from off-site renewables. In the meantime, even without CHP, the average BedZED household uses 45% les electricity and 81% less heat than people in the surrounding community. To encourage residents to cut down on their use of cars for transportation, BedZED provides parking at the periphery of the development to promote walking, biking, and community. While some residents find the parking arrangement less than ideal, most appreciate the positive side effect of getting to know their neighbors far more than the average person in the region and having an increased sense of community. There is a carpool program for residents, as well as London's first car club that allows residents to share a fleet of vehicles on a pay-as-you-drive basis. Pedestrians are prioritized with additional features, such as well lit walkways and drop curbs for wheelchairs and baby strollers. These measures have resulted in a 65% drop in fossil fuel miles driven by BedZED residents in the first seven years since the development's construction. However, due to higher than average use of air travel among BedZED residents compared to those in the surrounding area, their average ecological footprint from transportation is actually above average. Due to a number of innovations such as low flow toilets, water recycling, and rain water capture, BedZED residents also use only 87 litres of water a day - with 15 of them being rainwater or recycled water - compared to the regional average of 147 litres a day. Because it takes energy to move water, this translates not only to water savings, but to energy savings as well. BedZED aims to also reduce energy consumption - as well as overall ecological impact - of its residents by encouraging homegrown or local organic food consumption that emphasizes non-animal products, as well as by reducing and recycling waste. According to most recent monitoring, 60% of waste is recycled, and 86% of residents buy organic food. Ultimately, BedZED has a "One Planet Community" goal for its residents, that is, a lifestyle that can be supported by our one planet. Currently, the average UK citizen needs 2.9 planet Earths to sustain his or her consumption habits. BedZed dwellers are down to 2.4-2.6 planets. If BedZED returns to using CHP instead of natural gas, residents can make it to 1.7-1.9 planets. Getting down to one planet will take substantial reductions in air travel and/or substantial resource and emissions reductions in the airline industry. Additionally, BedZED is not large enough to reduce its impacts from capital investment and public services that make up 21% of the UK's ecological footprint. Larger sustainable communities that incorporate public services will likely be needed to make this type of improvement. BedZED has been the recipient of numerous awards and has a visitors center, along with guided tours where people can come to learn more about the community's journey toward sustainability.